All events that start with an asterisk * are always FREE and open to anyone! Morning swim practice for adult swimmers and triathletes. National Training Center pool - tell the front desk staff that you are there to train with SLAP. Practice runs from 6:00a - 7:00pm on Monday and Wednesday mornings. Coaching fees are $60 per calendar month (or included in the $75 monthly SLAP tri team fee) and are payable via cash or check or PayPal at the beginning of each month. All athletes are welcome to come TRY OUT THE SESSIONS free of charge for their first swim. Come meet the coaches and ask questions and see what's going on. We also encourage novice swimmers to take a private lesson before their first session. Windermere Prep School pool - once you enter through the main gate, take your immediate right turn and follow the parking lot all the way back until you can see the pool. Practice runs from 5:45a to 6:45a on Tuesday and Thursday mornings. We also encourage novice swimmers to take a private lesson before their first lesson. Lunch-time swim practice for adult swimmers and triathletes. National Training Center pool - tell the front desk staff that you are there to train with SLAP & show your "Paid in Full" membership image on your phone. Practice runs for 1 hour. Leaving from the NTC parking lot at 6:00pm. Group will meet by the flag pole at the front entrance. Run the short or long way to the bottom of Skyridge. Run repeats of the hill for 45 minutes, then return to NTC to get ready for swim practice. Evening swim practice for adult swimmers and triathletes. At the Celebration Fitness Center and Day spa pool, no gym membership is required - Located inside the Celebration Hospital (follow signs or ask for directions). Sign in on the SLAP page in the binder on the front desk. Practice runs from 6:30p to 7:30p on Tuesday and Thursday evenings. Coaching fees are $60 per calendar month (or $10 per single swim for visitors and drop-ins) (or included in the $75 monthly SLAP tri team fee) and are payable via cash or check or PayPal at the beginning of each month. 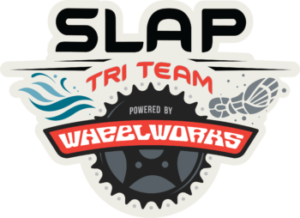 Coaching fees are $60 per calendar month ($50 if you are a SLAP Tri Team member) and are payable via cash or check or PayPal at the beginning of each month. We also encourage novice swimmers to take a 1 hour private session before their first lesson ($65). Leave from the NTC parking lot at 7:15a. Easy warm up to the Skyridge hill. Meet at Killarney Station (along the bike trail with bathrooms and playground) for a Wednesday evening interval run on the West Orange trail. Workout will be given by Coach Liesl on site! All SLAPPERS welcome to attend! Starts at Wheel Works, 6:45 departure. 40 mileish loop around lake Apopka. Best on a cyclocross, gravel, or MTB. We will announce what kind of bikes we will be on before hand. Half on road half off. Avg speed of the main group at the end 16-18mph. Practice runs from 6:00a - 7:00pm on Monday, Wednesday, & Friday mornings. Ride on the trail to Winter Garden and back. Extra miles can be added on the Hancock extension if wanted/needed. 2-4 repeats of wilson Lake 10K TT on your bike (with easy recovery between each). Be ready to swim in the lake at 10:30a! Bring appropriate attire for the weather (wetsuit, sunscreen, etc) and hydration/nutrition. During the colder months, we plan to swim for the first 45 minutes and then transition into a running workout. MORE pool time for #SLAPPERS! For anyone who wants to swim easy after the track session. Use this hour to work on technique/drills. Get some extra yardage in the water. Whatever the reason, it's always more fun to swim with friends! Join SLAP ambassadors Tagg & Reeli for an after-work brick training session inside Lake Louisa State Park. Tagg & Reeli will have the workout of the day. be prepared to bike and run! *meet at the Green Mountain trail head at 7:15a, roll out at 7:30a. *Easy warm up ride to the base of Sugarloaf. This is a no-drop ride with Coach Liesl. Ride the Sommer Sports Triathlon Sprint Bike course (around the lake and up the Bloxum Hill) once or twice. Riding from Waterfront Park at 7:30a. Easy warm up ride to Wilson Lake Parkway. Do 1, 2, or 3 reps of the 10k out-and-back course. This is a brick/transition training session with Coach Liesl. Bring your running and cycling gear. Free open water swim clinic and training session open to EVERYONE! Just sign the SLAP waiver online and come join us for an organized learning & training session in the water! Join us for a free yoga class under the trees at WFP. We will have a professional yoga instructor from One Yoga & Fitness Studio leading the class. Bring a yoga mat or large towel for the session. Join us for a causal team picnic after the morning training! Bring lunch, we will be at the picnic tables under the trees on the east side of the beach. Public grills are available if you want to make some fresh food! Wednesday evening at 6:00PM. We will ride the trail either from Wheel Works to Waterfront Park and back, or from Wheel Works to Apopka Station and back. So we’ll switch it up every so often. Both routes are about 14 miles each way, so about 28ish miles total. And we would have an A group (no waiting for dropped riders) and a B group (no drop). Dropped rides could just catch us on the way back. Join Coach Liesl for a BIG BRICK session!